Today’s blog post comes from Fran Wilson, a second grade teacher at Madeira Elementary School. Fran strives to promote an interest in science in her classroom and help students discover that not all scientists work in labs wearing white lab coats and safety goggles. She seeks meaningful opportunities for her students to participate in citizen scientist work to be responsible citizens, inspire future careers in science, and to connect science concepts to the real world. This fall I decided to implement Zooniverse’s Floating Forests in my second grade classroom. As soon as I read the description of the project, I knew it was perfect for addressing both my state science and social studies standards dealing with interactions within habitats – living things impact the environment in which they live and the environment can also impact living things. The best part was that my students would be able to engage in meaningful work to acquire these concepts. I like to incorporate project-based learning whenever I can to allow my students to assume ownership of their learning and Floating Forests was no exception. My first challenge was determining how to introduce my students to the project when I didn’t even live anywhere close to an ocean. Sea otters are very cute! I decided to use second graders’ love for animals as the entry to the study of kelp. I believe that children learn efficiently when curriculum is integrated across content areas so I made a plan. I selected the book Sea Otters by Suzi Eszterhas. The text tells how a mother sea otter cares for her growing pup. The book’s full page color photos with just the right amount of text on each page made this an ideal book. I chose to begin with a language arts lesson. I projected the book onto my Smartboard and modeled a lesson on determining the main idea and details using a page of the text. Sea Otters does not contain subtitles so I told my students that determining the main idea for a page of text was like creating the subtitle to accompany a portion of text. My students eagerly participated in guided practice of this skill while oohing and aahing at the photos of the sea otters and becoming increasingly more intrigued with the information presented in the book. By the time we finished reading the book, the children had seen the word kelp in the text and noticed the sea otters lounging on top of the ocean in a bed of kelp. It was the perfect time for me to pose some questions: What exactly is kelp? and Why is it important to the sea otter? My naturally curious students shared their thoughts and the interest in the sea otter and kelp escalated. How can we learn about the sea otter and kelp? That was the next question I posed after the groundwork was laid for engaging my students in collaborative research. Of course Sophia suggested that we find some more books on sea otters and Jon Miguel added that we should even find some on kelp. Tommaso proposed that we do an internet search to locate information on kelp. This planning step empowered my children with making the decisions about how to learn as well as reinforcing the steps a scientist might undergo while researching. Foreseeing my students’ plan, I had already checked out multiple books on sea otters written at various readability levels along with the few books on kelp that I was able to find. I selected the book Sea Otters by Laura Marsh to read aloud next to my students. This enabled them to compare the information presented in two books on sea otters. My students listened closely to identify the facts from the text that highlighted the importance of kelp to the sea otters. I started a large chart titled “Sea Otters and Kelp Facts” and modeled how to take notes for our shared research. After reading aloud each of our class notes, the students decided that they had learned some ways in which sea otters depended on kelp but that they still didn’t know much about kelp. At that point we started our internet search. The Floating Forests webpage provides some great resources, even for use with second graders! Under the education tab of the site, I found a link to a video produced by NOAA to introduce the kelp forest to my students. 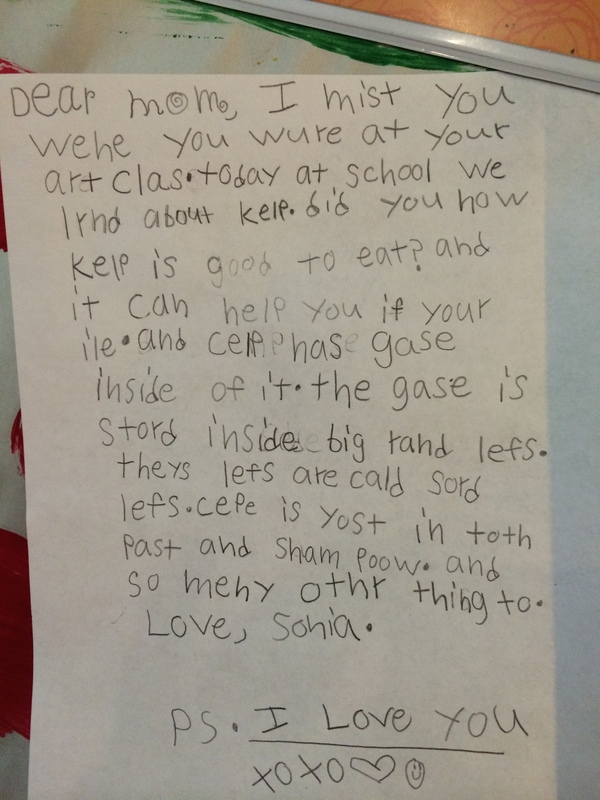 I was excited that one of my students suggested that they should take notes about kelp in their science journals. (I so love when they take the initiative in their learning!). I discovered several other informative, kid friendly sites with information and videos that we viewed in class and my students continued to take notes. After watching the videos Miki suddenly made the connection and proclaimed, “Hey we eat kelp at my house!” The next day she brought kelp in for everyone in the class to taste. Baker, Jeannie. The Hidden Forest. New York: Greenwillow Books, 2000. This story of two children retrieving a fish trap off the eastern coast of Tasmania helps children to see the kelp forest with wonder and appreciation. The author’s note at the end of the book offers insight to this disappearing kelp forest. Douglas, Lloyd. Kelp. New York: Scholastic, 2005. This simple book presents facts about the kelp forest. It’s perfect for lower level readers. Eszterhas, Suzi. Sea Otter. New York: Frances Lincoln Children’s Books, 2013. Readers can learn how a mother sea otter cares for her pup from birth until she is grown up. Marsh, Laura. Sea Otters. Des Moines, IA: National Geographic Children’s Books, 2014. This informative book contains interesting facts on sea otters and is accompanied by colorful photos. Slade, Suzanne. What If There Were No Sea Otters? : A Book about the Ocean Ecosystem. North Mankato, MN: Picture Window Books, 2011. This book enables children to see the importance of the sea otter as a “keystone species” in the kelp habitat. It explores the food chain and how the plants and animals of this ecosystem are connected to one another. Tatham, Betty. Baby Sea Otter. New York: Henry Holt and Company, 2005. A mother sea otter protects and cares for her pup until it is able to care for itself. Wu, Norbert. Beneath the Waves: Exploring the Hidden World of the Kelp Forest. San Franciso, CA: Chronicle Books, 1992. Children will be intrigued by the photos of the kelp forest and the animals that live in it while checking out this book. It is a more complex text that children will need guidance to read. What a list of kelp facts my students generated! After reading and researching about kelp on the internet, I compiled all of their facts onto our classroom chart. I sensed my students’ enthusiasm towards learning and researching but this was confirmed when I opened my email the next morning from a parent. Sonia’s note to her mom. I missed you when you were at your art class. Today at school we learned about kelp. Did you know kelp is good to eat? And it can help you if you’re ill. And kelp has gas inside of it. The gas is stored inside big round leaves. These leaves are called sword leaves. Kelp is used in toothpaste and shampoo. And so many other things too. Extending learning across the curriculum is really important to me so while the children were working collaboratively to research kelp through viewing websites and the few books I found, I was meeting with guided reading groups to read and discuss books on ocean life. The children began to think about the ocean as a habitat for many animals and the kelp forest as a very important habitat! After sharing the book What if There Were No Sea Otters? : A Book About the Ocean Ecosystem by Suzanne Slade with a small group of children, Ben announced, “I get it! It’s all connected like a big puzzle!” Kalley latched onto the term “keystone species” highlighted for the sea otters in the text and Sonia explained the relationship between the sea otter and the kelp in the ocean habitat. All these relationships between the many sea animals in the kelp habitat had the children talking. We needed to solidify their thoughts in a way that we could see them. That’s when the children created a giant model of a kelp habitat. The kelp stalks grew quickly on the large blue poster paper while sea otters were being drawn in a corner of the room, prickly purple and red sea urchins were crafted, fish with fins formed, and kelp labels were created. Of course a new page was added to the children’s book on kelp. Now it was time to publish! A digital story was created with all of the children’s research. I scanned the children’s writing along with their illustrations. I used Keynote and placed each of the children’s pages of text onto a slide. A small group of children were recorded reading the text upon the slides. The keynote was then exported as an iMovie. 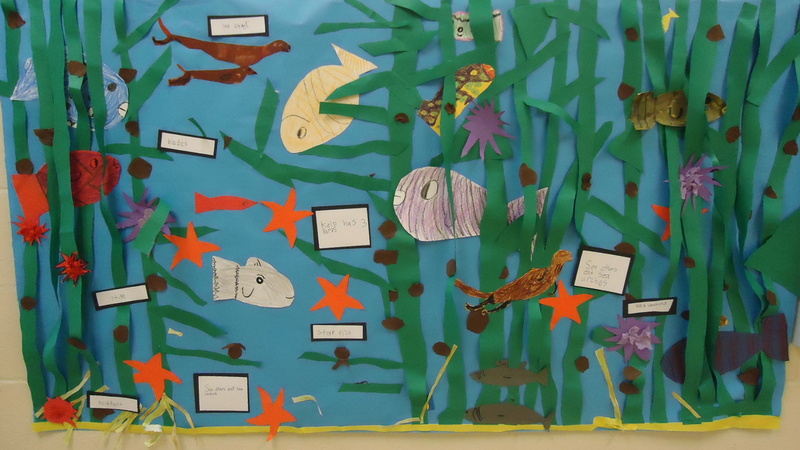 We posted the individual pages of the children’s kelp research in the hall for all the other students of our school to enjoy. I submitted the digital story to the Floating Forests blog. Here is the link to view my students’ digital informational book on kelp. It was finally the right time! My students knew about kelp and understood what an important habitat it was for many sea creatures. Now was the time for sharing Zooniverse’s Floating Forests project with my class. Do you think you’d like to help some scientists with a special project on kelp? I asked. My students were SO excited to become involved. They were even more excited when they realized that they would be looking for kelp on real satellite photos taken from space! First, I prepared for the children’s “official training.” I connected my computer to my Smartboard and the children viewed the brief tutorial on the Floating Forests website. They quickly learned how to classify the satellite photos and circle the kelp. We circled hundreds of photos together and each time they spotted kelp they became very excited. Circling kelp on the Floating Forests website continues to be a favorite classroom activity. My students enjoy working in teams of two or three on an iPad taking turns to mark the satellite photos. They often keep a tally of how many times they identified kelp on a photo. I love the discussion it prompts among teams of children circling photos. Through their work, they’ve learned that kelp is found near coastlines. They’re intrigued with the places in the world that kelp might be found. Participating as citizen scientists with the Floating Forest Project has enabled my students to engage in meaningful work. They feel responsible contributing to important scientific research. 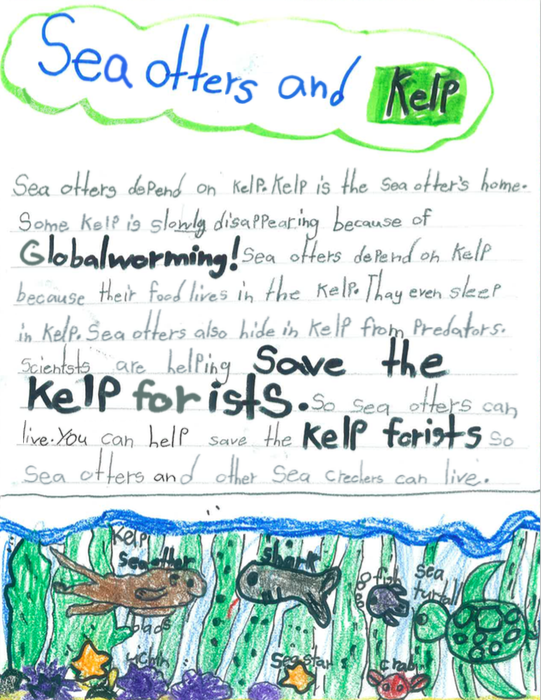 My students know that some of the kelp forests are disappearing and they are genuinely concerned. This work has made them more interested in their world and has instilled a need to work collaboratively to care for our earth. My students’ interest in science has been fostered and perhaps some of them will even be inspired to become scientists. I feel like my students have gained so much from this learning opportunity but perhaps it’s what they think that counts most.